Sometimes it seems like all anyone brings to potlucks this time of year is cookies. But no one can make a meal of dessert alone, so let us humbly suggest you go a different route. Carrots! We love carrots in the winter. They’re cheap, they’re colorful, can easily be prepared and, with just a few simple additions, become a gourmet side. Here, 5 impressive carrot recipes that take very little time and effort but taste delicious. Cooking these carrots in carrot and orange juice helps maintain the vegetable's bright orange color. A quick sauté then 30 minutes in the oven, these thyme-flavored carrots will be tender and sweet. Oh and you can prep this the day before to help minimize day-of holiday stress. Everything is better with garlic, especially carrots. Just toss with butter and seasoning and into the oven they go to roast. Super simple and easily paired with almost all main dishes, these carrots are seasoned with marjoram for a warm, wintery flavor. 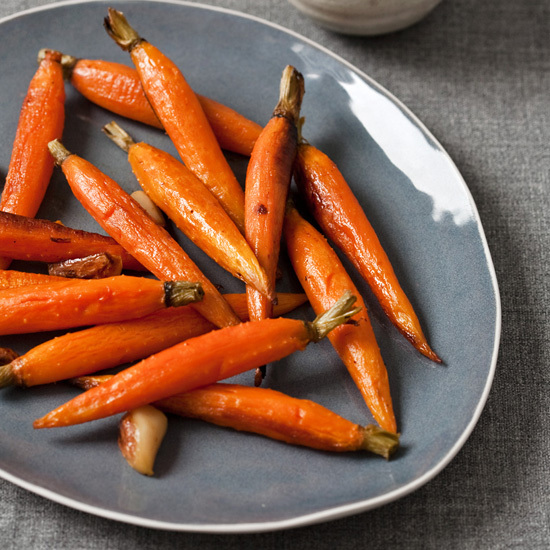 Please all of the picky eaters with these delicious sweet and salty carrots.